Washington Gov. Christine Gregoire has appointed Whitworth President Emeritus Bill Robinson to a new higher education steering committee formed by the Washington Legislature to review the structure of higher ed governance for the state. The committee's recommendations to the Legislature are expected to mark an important step toward improving the effectiveness of the state's higher education system. In May, the Legislature approved Senate Bill 5182, which will eliminate the Higher Education Coordinating Board (HECB) on July 1, 2012. The bill established the higher education steering committee and directed it to determine the duties of a new agency to replace the HECB. "When Gov. Gregoire asked me to serve on this committee, I realized I would likely provide the principal voice on behalf of independent higher education," Robinson says. "As I considered the invitation, it felt like both a duty and an honor. I have lived my life in the arena of higher education, so I hope I can have a positive influence." Gov. Gregoire, who will chair the committee, was allowed to select at least two members of the public to serve on it, and she invited Robinson because she values his extensive higher ed experience and respects his leadership ability. "Our state's higher education system benefits from the contributions of both public and independent institutions, and Gov. Gregoire appreciates Bill Robinson's experience as a leader in independent education," says Leslie Goldstein, an executive policy advisor in the governor's office. "She also respects Bill's thoughtfulness as a leader and values his insights on these important issues." The Legislature formed the higher education steering committee to determine the kind of state-level governance Washington should have for public higher education moving forward. The committee is responsible for reviewing the coordination, planning, and communication for higher education in the state and for establishing the purpose and functions of the council for higher education. The committee also will consider options for creating an effective and efficient higher ed system and coordinating key sectors including through the P-20 system; improving coordination of institutions of higher education and sectors with specific attention to strategic planning, system design, and transfer and articulation; improving structures and functions related to administration and regulation of the institutions and programs including financial aid, GET, federal grants, new degree program approval, authorization to offer degrees, reporting performance date, and minimum admission standards; and establishing the composition and mission of the council for higher education. The committee's recommendations are due to the Legislature by this December. Robinson was president at Whitworth from 1993-2010, making him the university's second-longest-serving and one of its most influential presidents. During his tenure, the number of freshman applications to Whitworth increased 565 percent; enrollment grew 60 percent while student academic profile and selectivity steadily improved; and retention and graduation rates reached record highs well above national averages. This October, Whitworth will dedicate a new $32 million science facility, named the William P. and Bonnie V. Robinson Science Hall in honor of the Robinsons and their significant contributions to the university. 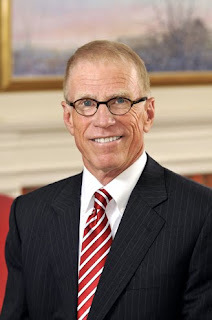 Known for his relational and approachable leadership style, Robinson devoted much of his energy during his presidency to connecting in person and in writing with students, employees and friends of the university. Before his time at Whitworth, Robinson served for seven years as president of Manchester College, in Indiana. He has done extensive speaking, writing and research on leadership and faith-related issues, and he is the author of two books: Incarnate Leadership: Five Leadership Lessons from the Life of Jesus (Zondervan, 2009), and Leading People from the Middle – The Universal Mission of Mind and Heart (Executive Excellence Publishing, 2002), which was republished by IUniverse in 2009. Since stepping down from the Whitworth presidency in July 2010, Robinson has continued championing the university and its mission; he is currently compiling a book of addresses he gave during his last 10 years as Whitworth’s president. He also has been doing consulting work for the Seattle-based accounting firm Moss Adams LLP and for a number of colleges and universities. In addition, he serves on several boards, including the executive committee of Princeton Seminary and the board of the Max De Pree Center for Leadership at Fuller Seminary. He has worked with churches and nonprofits on leadership training, and he has been active speaking in a wide range of venues. He also reports, "Since stepping out of the presidency, I have less ambient worry in my life, so, of course, I'm worried I might not be remembering something." In addition to Gregoire and Robinson, other members of the steering committee include State Sens. Randi Becker and Derek Kilmer; State Reps. Larry Haler and Larry Seaquist; University of Washington President Michael Young; Central Washington University President Jim Gaudino; South Puget Sound Community College President Gerald Pumphrey; Executive Director of the State Board for Community and Technical Colleges Charlie Earl; Director of the Department of Early Learning Bette Hyde; Executive Director of the Association of Washington School Principals Gary Kipp; and citizen Jane Noland. Leslie Goldstein, executive policy advisor, Governor's Executive Policy Office, (360) 902-0532, or leslie.goldstein@gov.wa.gov.